Franzia’s been mighty busy. 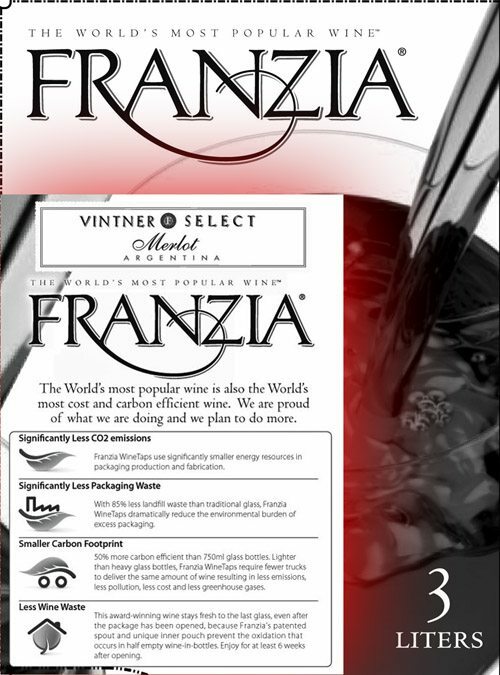 Franzia’s recent labels proclaim “The World’s Most Popular Wine.” That’s a lot of bag-in-box and other packages. The wine industry is perhaps the most vulnerable of any food and beverage producer to “carbon criticism,” due to its historical reliance on heavyweight glass packaging and its failure to migrate to more environmentally sensitive packages. … As the world’s leader in Bag-In-Box (BIB) packaging, [The Wine Group, Inc.] is in a unique position to assist retailers with innovative 3L and 5L BIB packages that eliminate the freshness trade-off associated with most other forms of alternative packaging. … The Wine Group is taking aggressive measures to reduce overall energy consumption by our wineries, and leading the industry to implement local bottling of imported and exported wine. This reduces carbon emissions through unnecessary transportation of heavy glass,” said [David Kent, CEO]. This packaging consortium has a good FAQ about the environmental issues but still it would be good to see more sources and evidence. This does not answer the question asked, How can Franzia claim to be the world’s most popular wine”?